2001 - Paris Veranda, white grey Lusitano colt by Paraiso. Owned by Natasha Powers/Powers Farm, FL. 2002 - Cristobenno, grey with black mane and tail Andalusian colt by Cristobal. Owned by Natasha Powers/Powers Farm, FL. 2003 - Tobasco Verb King, black Andalusian colt by Toboso. Owned by Natasha Powers/Powers Farm, FL. 2004 - Festival BC, grey (black) Andalusian colt by Politico. Owned by Cynthia Michelakis/Yaddo Stud. 2005 - Celestino, dapple gray Andalusian filly by Politico. Owned by Autumn Rupert/Twilight Mirkwood. 2006 - Politico Crome C, grey (black) Andalusian colt by Politico. Owned by Ruthie's Ranch. 2007 - Verbena's Court, grey Andalusian filly by Politico. Owned by Ruthie's Ranch. 2008 - Diamante, grey (black) Andalusian colt by Serpiente. Owned by Shanly Bryant/Circle A Ranch. 2009 - Archibaldo, bay Andalusian colt by Arlequin. Owned by Reagan Womack/Atlantis Equestrian Center. 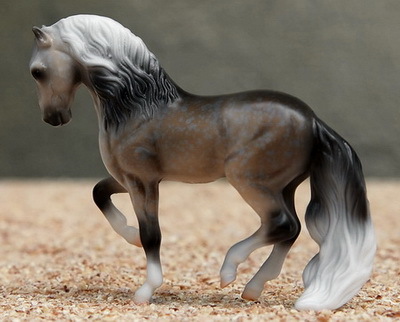 2010 - Dancing Reflections C, buckskin Andalusian filly by Carmelo DFC. Owned by Yakira Goldsberry/Sunset Stables. 2011 - Divertido, grey (black) Andalusian filly by Serpiente. Owned by Anna Ruby Whitmire/Over the Rainbow Stables. 2012 - Cimaruta C, grey (bay) Andalusian filly by Santiago®. Owned by Kay Myers/Caballos Del Mar. 2013 - Beat Of The Music, white grey Andalusian colt by Valentino IV. Owned by Natasha Powers/Powers Stud. 2014 - Eric Heatherly, dark bay Andalusian colt by Sigilo. Owned by Natasha Powers/Powers Ranch.